It is National Coffee Day today, which means... a moodboard with coffee related gadgets and accessories. 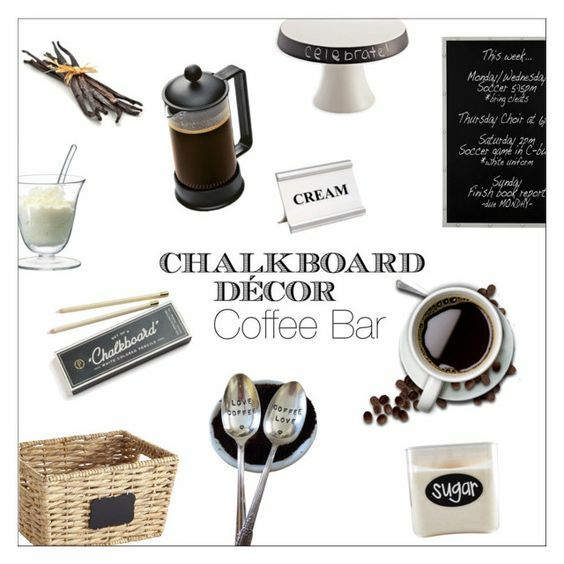 I think the chalkboard theme especially suits cafés and therefore kitchens, too. If I ever grow up and own my own kitchen, I will have a coffee bar at home. Until it happens, I just collect inspirational photos of coffee nooks and cabinets. Really. As a child I have always loved the smell of coffee. I do not remember if I ever tasted it - probably yes, out of curiosity, and of course it was awful. It took me many years, until about eight years ago, when Monika my collegaue got me into the habit of drinking coffee with her. Later on buttered croissants joined the ritual, and today I am a huge fan of Arabica. Coffee time is 30 minutes of calm, when I recharge my batteries. If at home, I often read a book while having a latte, or do something I enjoy - browsing on Pinterest or working on this blog. But yesterday, for instance, I grabbed a takeaway POPCORN latte in my favourite café (check this link - it was accompined by real popcorn, too), and enjoyed a walk in the city - it was just so lovely: warm sunny afternoon, yellowing leaves, watching the autumn colours of the city. And popcorn latte was the weirdest thing I ever tasted. I am really interested: what is coffee time for you?